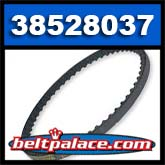 38528037 BELT (Single Pack) OEM HOOVER GEAR BELT. WHOLESALE PRICES! HOOVER 38528037 (TURBO TOOL) BELT. This gear/toothed belt drives the Agitator (brush) in the hand tool included with Hoover WindTunnel vacuum models and similar: S3639---, S3639050, S3646xx, U5458900, U5458910, U5460900, U5462900, U5720950, U5720960, U6434900, U6436900, U6439900, U6454900, U6471900, U6476900, U6476910, U66009RM, U6607900, U6616900, U6617960, U6618900, U6630900, U6632900, U6634900, U6637960, UH50000.